The end of Golden Gate Park...at the ocean. 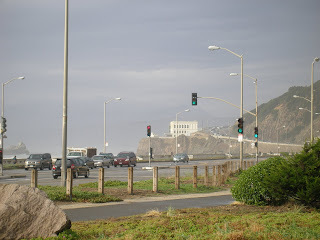 The Cliff House is in the distance. Okay, so I've been to Golden Gate Park several times. However, this is the first time I really and truly realized just how big of a park it is and how many different things are encompassed in the park. First of all, I didn't actually realize that the edge of the park was the Great Highway, which is the road running along the ocean. Nor, did I realize that when I was looking at the map of Golden Gate Park trying to figure out how to get to the Dutch Windmill that I was looking at the map completely wrong. It took me a while to figure out that we went the wrong way, but ended up in the right place...even though I was looking at the wrong half of the map...we weren't there yet. If that sounds confusing, it is probably because it is...due to the size of Golden Gate Park. I highly recommend visiting some of the many activities and sites encompassed within the park. Definitely get a map. A detailed map, if possible. I purchased a map at the Conservatory of the Flowers...it was helpful, but didn't include all of the many pathways in the park. 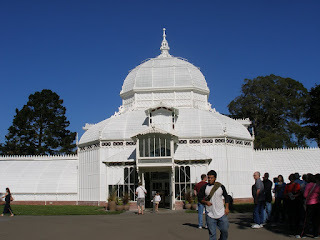 However, we (the boyfriend and I) were able to get from the Conservatory of the Flowers to the California Academy of Sciences and back using the map. The to and from were by different paths, but we managed not to get lost. The Conservatory of the Flowers has a nice exhibit of plants in varying climates...most more tropical than it ever gets in San Francisco. I will say that the temperature of a couple rooms reminded me greatly of July or August in Cincinnati. There are also many flowers to look at outside the Conservatory. The cost to get in is $5.00 per adult, but is free to everyone on the first Tuesday of every month (the Conservatory is closed on Mondays). The flowers were beautiful...I will have another post with just flowers from the Conservatory. Besides the Conservatory, Golden Gate Park is home to a beautiful botanical garden that is quite large and has a variety of plants for all seasons. The San Francisco Botanical Garden has an entrance across from the Japanese Tea Garden. There are daily, free, docent led tours. However, if you just want to wander amongst the various gardens, there is much to look at and many places to enjoy a break or to people watch. This time I got to see the Buffalo Paddock, although it was too muddy to go around it too much. I also got to see the Dutch Windmill which had some flowers in the garden, although not in the tulip garden as it was October, not March. 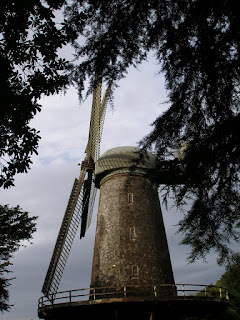 The Dutch Windmill is situated towards the edge of Golden Gate Park approaching the Great Highway. I also visited the California Academy of Sciences, which just re-opened after several years of being under renovation. The California Academy of Sciences houses both the Steinhart Aquarium and the Morrison Planetarium. It also is newly equipped with a spectacular living roof. The Planetarium requires timed tickets, but doesn't cost extra from your admission. A quick tip for getting tickets to the Academy, especially on the weekend...use the self serve ticket kiosks below the steps to the museum. If you're hungry, the Academy has a great restaurant with a variety of food selections. Prices are typically high, as is the case with most food purchased at a museum; however, the food was fresh and very good. The day that we went to the Academy, the restaurant was crowded and there wasn't enough seating for everyone purchasing food. I found the food station set-up to be a little disorganized. It was hard to tell where you should go and if there was a line or what the lines were for, it made for quite a bit of chaos. The register lines were just as chaotic...it doesn't seem as if they made enough spaced for the register lines to not mix in with the food station lines. And, they definitely need to add more seating. We were there on a weekday...I can't even begin to imagine the chaos of a weekend. Other activities in Golden Gate Park include the deYoung Museum (they currently have an Yves St. Laurent exhibit that I want to see), the Japanese Tea Garden, the various gardens and lakes, and the Beach Chalet and Park Chalet, a history center and restaurant off the Great Highway at the edge of the park. Besides these specific activities, there are many places for picnics, sports activities, gentle strolls, or leisurely people watching. Definitely check out Golden Gate Park and its many activities.